Price: $20 U.S. Three colors are available. If your work space is getting cluttered with USB chargers, the SNAP Power Duplex Charger will provide some relief. 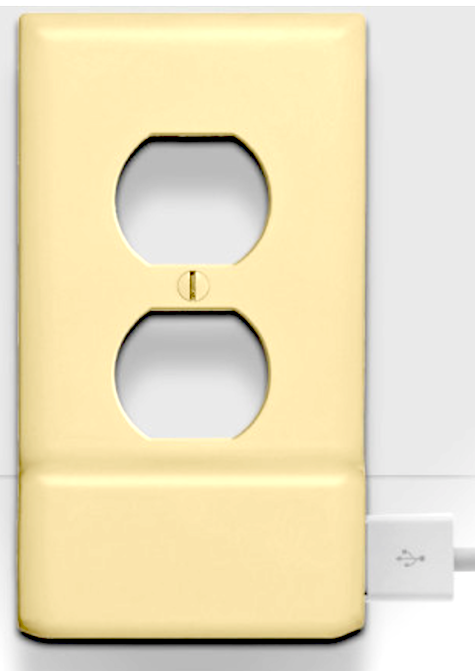 The charger is a faceplate for any standard U.S.-style electrical outlet, with a USB 2 port built in. It takes less than a minute to install. Turn off the electricity to the outlet you’re planning to convert. Remove the screw that holds your faceplate in place. Then remove your old faceplate and snap the new one in place. Put the screw back, turn the power back on, and you’re ready to plug in any device that comes with a USB charger. It’s fast and simple. If you buy these chargers in multiples (see website) the price per unit drops. You can get 10 for $160. Impressive printed literature is included. Well done, SnapPower. Next: how about a USB 3 version, and a double USB version too, plus smart USB that knows the difference between charging an iPad and an iPhone? !